With NextEra as a major player in Ontario's wind energy business along with Siemens (who has the distinction of paying the largest fine ever under the Foreign Corrupt Practices Act) and Samsung (with it's own scandals), one has to wonder whether the government knew who they were inviting into the province when they opened the flood gates under the Green Energy Act in 2009. Electricity generating wind turbines in Shelburne, Ontario. This autumn has not been kind to NextEra's Ontario operation. 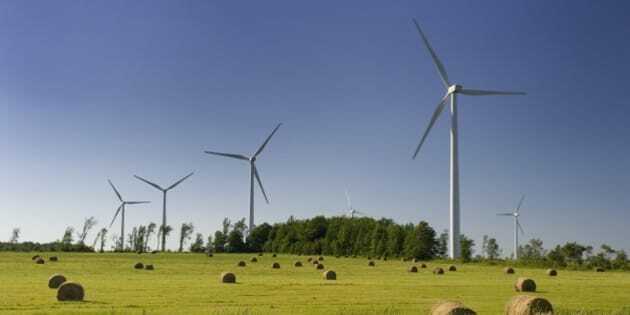 Some of the turbines they own in Ontario were found to be throwing objects into farmers fields during harvest season, for reasons the Ministry of Environment apparently refuses to investigate. Their "success" in collecting feed-in tariff contracts from the Ontario Liberals is now subject to litigation filed by oil baron T. Boone Pickens. If he is successful in proving allegations of "abuse of power" and "undo political interference," the Liberals mismanagement of the energy file could cost Ontarians an extra $700 million dollars. "A review of documents and emails between NextEra executives, lobbyists and government officials show that NextEra met and held calls with high-level officials at the Ontario Ministry of Energy, the premier's office and the power authority, even as Mesa Power executives were told they could not speak to officials until contracts were awarded. When NextEra lobbyists requested more information, officials sometimes responded within hours." It is important to recall that this was in the era of gas plants being moved to protect under-performing Liberal MPPs from electoral defeat, but that said, NextEra's questionable behaviour isn't limited to Ontario. As fate would have it, a NextEra lobbyist in the United States developed a romantic relationship with a U.S. government official overseeing a series of NextEra applications to construct renewable energy projects on public lands in the same month that her employment began at NextEra. Emails detail NextEra leveraging their lobbyist's relationship with a key Department of Interior official that may have prevented a scientific review of derailing a project that began killing golden eagles within a month of operating. The Department of Justice investigation into the relationship between NextEra and the U.S. Department of Interior highlights a number of examples of professional contact between the lobbyist and key official that was initiated by NextEra. The report is a fascinating read. Considering what is known about the Ontario Liberal's gas plant scandal and all of the political interference that went on there, not to mention a U.S. Department of Justice investigation into NextEra's lobbying tactics in the United States, it will be fascinating to see what happens with T. Boone Pickens' claim. Elsewhere in Ontario, NextEra has been negotiating "community vibrancy funds" with municipalities that are contingent on municipal councils passing favourable resolutions that will support NextEra in winning new business. They claim the whole thing is legal, but when is dangling benefits in front of decision-makers' faces while instructing them exactly how to use their official powers in a manner that benefits you legal or ethical? Ben Greenhouse, NextEra's senior Canadian executive, has explicitly stated funds are conditional on municipal support in aiding new business developments, a message further reinforced by their Canadian staff in emails to municipal officials. The only piece of good news for Ontarians related to the push for more wind turbines into our province is that the IESO has slowed down their approval process, delaying contract awards by another three months. Let's hope they take this time to clean up any "undo political interference" or "abuse of power" issues that may or may not exist within Ontario's green energy procurement process. That said, with NextEra as a major player in Ontario's wind energy business along with Siemens (who has the distinction of paying the largest fine ever under the Foreign Corrupt Practices Act over extensive bribery of foreign officials in 10 different countries) and Samsung (with it's own bribery scandals being well-known), one has to wonder whether the government knew who they were inviting into the province when they opened the flood gates under the Green Energy Act in 2009. Whether Dalton McGuinty truly favoured NextEra will be decided in court, but Kathleen Wynne has the opportunity to turn the page and end any corruption within Ontario's green energy procurement process, and would be wise to do so. John Laforet is the Former President of Wind Concerns Ontario, and is the Principal of Broadview Strategy Group, which is working with Bon Echo Area Residents Against Turbines, a community group opposed to a NextEra project proposed for their community.